Last night, Diane Von Furstenberg confessed she's unaware where her Haiti charity money went, Norma Kamali said her plus-size clothes might inspire her overweight customers to "look at other lifestyle choices," and Prabal Gurung talked Twitter and Demi Moore. The three designers spoke with Fern Mallis and the New York Times' Eric Wilson last night for over an hour to an almost full house in Midtown. They roughly covered the future of the garment industry, the history of American fashion, the Internet, women, feminism, computers, the 60s, and the flaws of the American educational system. 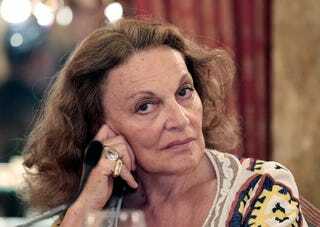 First, Diane Von Furstenberg offered up a defense of leopard print. "Leopard print is something that is completely timeless. It was hot in the 30s, in the 40s, in the 50s, in the 60s, in the 70s — all the time. And why? Why? Because there's nothing more beautiful than a leopard. The way the print comes and moves and goes up and down and narrows," she said. When you wear it, "something about the woman feels feline," she continued, pronouncing "feline" as fell-line. "And it's kind of nice to feel feline." "I think it's interesting that it almost looks like camouflage," said Wilson. "Well, I guess that's why the leopards wear it," replied von Furstenberg. The audience laughed. "Touché!" said Wilson. Norma Kamali, who has had a website since 1996 and was Internet-aware enough to be the subject of a New York Times article entitled "Kamali Meets Fans On Line" back in 1999, talked about what got her interested in technology. Turns out, it was a UNIVAC computer. In the 60s, "I got a job at Northwest Orient airlines, selling tickets — not on the airplane — and selling tours," she explained. "And the airlines at the time were like Apple. They were the place to be. And so — computers. I was working on a UNIVAC computer in the 60s. And I learned how incredible that was, at a young age I learned the power of how fast communication could change everything." This led to a long, digressive discussion of Twitter. Prabal Gurung made headlines a year ago when Demi Moore tweeted about wearing one of his dresses. "I went online and I saw it so I Tweeted back to her, saying thank you," said the young Nepali-born designer, "and she Tweeted back to me, and all of a sudden I got these followers. Immediately I think I understood the power of information, because that story was picked up all over the world." "I Twitter," said Von Furstenberg, "and the first thing I Twittered [was] 'I got robbed.' And I had only sent two Twitters. And I was in Madrid in the museum, and I got robbed. So, I Twittered, I said, ‘I got robbed.' And wow, did I see the power. I mean, it went all over." It's true; even we made the mugging a headline in Rag Trade. Von Furstenberg has over 82,000 followers on the micro-blogging service, and says the magic word that'll make people respond to any tweet is "love." Mallis started talking about the ability of the collegiality of the fashion industry, and its ability to work together, especially through organizations like the Council of Fashion Designers of America. Von Furstenberg interrupted: "The earthquake in Haiti, we met the next day, and we raised $1 million," she said. The audience began to applaud. "I don't know what they did with it, but..."
Norma Kamali, who designs a (pretty stylish) line for Wal-Mart, just added sleepwear to it, in sizes up to 3XL. Last night she revealed plus sizes are forthcoming to the rest of her Wal-Mart collection, too. "I just finished designing plus-size swimsuits," she said. But Kamali showed some of the ambivalence she recently expressed to Women's Wear Daily about designing plus-size pieces, where she was quoted as saying, "I never thought I would be ecstatic about designing plus-size sleepwear." Last night, she explained that she was very proud of her first plus-size collection. "I really do care about women and self-esteem," she said, and giving the plus-size customer her aesthetic consideration felt good. "And maybe I can get to her, and influence her to look at other lifestyle choices," continued Kamali. "But first, make her look great." If that sounded a little tone-deaf, it wasn't nearly as bad as what von Furstenberg said next. In discussing the future of the garment industry — New York's second-largest industry after financial services, according to the designer — she said that maybe the Garment District would relocate to suit changing patterns of land usage. "It's Midtown today, but maybe it won't be Midtown. Maybe it'll be Brooklyn. Or maybe it'll be, um, err — across the bridge there, the place there, uh —" She seemed unable to bring to mind the word "Queens." "No, no — the bridge, uh..." said von Furstenberg. She trailed off and muttered something. "But, anyway." Was the designer who recently told me she could never quite figure out where Queens is kidding? She was not. "I know it's out there somewhere," she said. It must be, she added. It says Queens right there on the taxi map. Perhaps we now know to whom the blind item refers. In the question and answer portion of the evening, a student newly admitted to the Fashion Institute of Technology asked Gurung which he found more difficult, patternmaking or draping. "Draping is like dancing, patternmaking is like learning to dance," he replied. "You should put that on a pillow," said Wilson. "I just came up with that!"